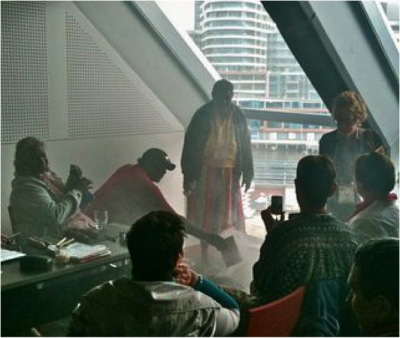 After the introductory remarks to the session Maama—The Untouchables Ones: From Cave to Canvas, several aboriginal elders invited us to participate in a smoking ceremony. What I gleaned from these aborigines about the ritual is that whenever they leave their land and enter another, they seek protection by burning special herbs and woods. The smoking ritual also protects those with whom they share their tradition – without doing the smoking ritual the aborigines would feel responsible for any misfortune or illness would come to the others. I was rather surprised but also pleased when I saw the elders create a rather large billowing of smoke in the corner of this small conference room. Each one of us was invited to step through the smoke and breathe it in. The smoke was thick and the smell intense. Within moments the smoke penetrated the entire room and settled on our bodies. After some time and to no one’s surprise, a fire marshal entered the room to investigate the situation. At that point the small fire had been extinguished and only the thick smoke hovered in the air. He checked with the session monitor about the goings-on in the room and left with a slight expression of frustration but added no further holdup. I could not help but notice that while the smoke provided protection to one culture, it was a sign of danger to another. I think it was just as proper for the Ngarinyin elders to perform their smoking ceremony as it was for the fire marshal to check the room for safety. Fortunately we were in the context of a cross-cultural conference dedicated to developing harmony between diverse spiritual and religious traditions. The fire marshal was fairly non-reactive and seemed quite sensitive to the situation so any quarrel between the marshal and the presenters was avoided. But what if this had not been the case? And who is to say which safety protocol is more important than the other? This time as events unfolded, the Ngarinyin elders were able to hold and complete their smoking ceremony on their and our behalves. Nevertheless the safety protocol of the other (and dominant) culture had been broken, and this with very little actual risk to anyone. Conversely, how often have we broken the protocols of the aborigines without any thought to it and with dramatic impact? The tensions that arise when the protocols of diverse cultures interfere with each other represent, in my view, time and again the very opportunities we are looking for to explore new and creative ways to navigate between cultures. For me this is not about one culture needing to adopt the cultural processes of another, for even though that has been the dominant paradigm, this approach always entails some loss for one of the cultures. What stands out to me about the incident is that it is possible to create environments that can adapt to and sensitively respond to cultural practices that could be experienced as disruptive. The fire marshal approached the situation with a ‘light’ touch that was aligned with the purpose of the conference. And more importantly, the aboriginal people had the courage to share their tradition and offer their protection in spite of their tragic history of oppression. This post was originally published in my blog Liminal Songlines. The intention of that blog was to help capture my initial understanding of the spiritual healing traditions of the Aboriginal peoples of Australia while I lived in Australia from 2009 to 2012. Much of what I learned there is relevant to my continuing explorations of rites of passages in indigenous and contemporary cultures, the concept of liminality, and working with change in our turbulent times.